Your essential oils help promote your good health and well-being, so why not reciprocate? Rather than tossing them in a plastic bag or cosmetic case, secure these wonderful little helpers in their own container built to go on the road. Then, no matter where you go or how you get there, your oils will arrive safe and secure. Whether you use oils to reduce anxiety, control headaches or stress, or to keep the mosquitoes at bay, your oils can arrive protected, whole and ready to help. Depending on your space limitations, it can be tempting to put all your small bottles of liquid into one case, but the risk of breakage can be worrisome. For train or car travel, a separate bag with a strap may be nice (watch the video below), but on an airplane this would count as a carry-on. If you need a purse and briefcase or backpack, a separate carrying bag won’t work. 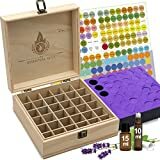 You can find essential oil cases in multiple formats, from a hard-sided wooden case to a soft-sided zipper case. Your travel needs will likely dictate which version is best for you. If you’re going through airport security and have your oils in a carry-on, a wooden box may get unwelcome attention. While soft-sided cases have long been used to carry make-up and toiletries, a wooden box will usually have metal hardware. This hardware will likely get picked up on X-Ray, and if security goes through your bag, there’s a risk of having your oils pulled out, handled and possibly dropped. While a wooden case may be ideal for home storage, you may not want it in your suitcase. Spills and breakage happen. When reviewing your purchase, be sure to look for a material that will resist stains until you can get the oil cleaned up. It’s nice to think that a heavy cotton case is all natural, but if it’s not treated with a product that offers liquid resistance, your oil carrying case will wind up a stained mess. Properly stored, your oils should last for years. However, glass can be scarred if it rubs against other glass surfaces, leaving your bottles looking scratched and dingy. Study the construction of the case. Of course, you need padding that will protect the bottles from outside forces, but does the case you want to protect the containers from one another? If there’s not enough central padding to the case, you may still wind up with broken or scarred bottles. Many oil cases display only the tops of the bottles, so you’ll need to spend time labeling your containers. Over time, these labels may curl up, peel off and be lost. Of course, some product lines come with a top label already affixed, so in this case, you’re all set! If you don’t want to worry about labeling your bottles, be aware that there are many portable options for your oils that fit the bottles in mesh pouches or storage slots. These pouches display the label on the side of the bottle and make it easy to note which oil is in which pouch. These cases carry fewer bottles, but if you’re traveling and just need to take the basics, a mesh pouch bag may save you some time. Both soft and hard-sided cases generally offer some cushion. For travelers who need to check a bag (and their oils), this cushion is critical. Even the most careful handler can’t stop your suitcase from getting banged around, and oils are not cheap. The last thing you want to do is open your suitcase to find smashed oil bottles, wasted product and ruined garments. If you’re checking your oils, make sure your case cushions the bottles from the top and the bottom. Banging around from side to side will not likely break the bottle, but a crushing blow from the top could smash the glass container. The threaded portion of the bottle is the most fragile. You’ll want to confirm that the top of your case is well padded. A handle that’s stitched on to a portion of the case can put all your oils at risk. When possible, find a case that includes handle construction that wraps around or at least extends down the side the case. For best portability, consider a small case for just a few oils without a handle. Such a case should offer plenty of padding, easy display and have no need for a handle at all. The Hytek case is available in a variety of colors and patterns so you can be sure to enjoy a well-coordinated traveling adventure! This large case has space for more than 30 bottles and offers room for 5 bottles with side display and 30 bottles with a top display. The bottle labels are not included in this kit, so you’ll need to find another source for your cap labels. In addition, the carrying strap only covers the top of the case. While the case is well-constructed, it should be noted that if the zipper fails, all your oils will be at risk. However, this case has a dual zipper action so you can close it from either side. If you’ve ever suffered a handle fail, you may just want to carry this case from the bottom. As it’s only 7 inches square and 3 inches tall, you’re in luck! When packing this case, it should be noted that the sides and top are soft. If possible, cushion this case in the center of your suitcase so if your checked bag takes a hard hit, your bottles won’t be damaged. It should be noted that this case is constructed of a heavy-duty cotton or canvas material. While it is water resistant, it is absorbent. Should you have a spill, this case will not be easy to clean up. This extremely well-cushioned case offers top display options for up to 30 bottles of either 10 to 15 ml. The labels are included and feature 96 preprinted oil names and 96 blank labels. You can use this case both at home and on the road; it offers plenty of storage. You’ll find this case will tuck easily into a large suitcase. It’s 8 inches wide, 4 inches high and 6 inches deep. The double zipper construction makes it easy to get into and close up safely. There is a carrying handle on the back of the case. It’s well-cushioned for easy transport. If you leave the zipper open, your oils would likely dump out when you pick it up by the handle. However, as the lid is quite thick and the zipper wraps around the body of the case (not just the top) carrying this case by the handle should be quite safe. The label says it all! If you prefer to apply your oils via roller bottle, this case is ideal for your needs. It’s available in a variety of colors and has a hard shell exterior. Once it’s all sealed up, you can easily tuck this case into a bag that’s going to be checked and have little worry of breakage. This case offers great padding, both between the outer shell and your bottles and to protect the bottles from one another. The zipper is positioned in the center of the case so when you undo it, the case opens like a book. This essential oil case is built to last! If you need to check your oils and are short on space, a hardshell case may be just what you need. It’s less than 6 inches wide and just under 2 inches tall. Also, this container features mesh pouches and side display, so no sticky labels to affix or monitor. For those who prefer to travel with a full set of oils, this may not be the best case to purchase. This is definitely just a traveling case for your most necessary products. However, if space is limited and you fear your luggage will take a beating, this container is a great option. The pretty purple Luxja case has space for 12 bottles in mesh pouches with side display. This is a soft case, but well-padded and has a protective cushion at the center to keep the bottles from rubbing against each other. The bag is made of heavy-duty nylon for durability and easy clean up should you have a spill or breakage. Your Luxja case will pack well. It’s less than 9 inches long and just under 5 inches high. At only 3 inches thick, you can easily place this in a large purse carry-on for easy access. This bag features a well-constructed handle stitched down the spine of the bag. It should wear extremely well. Besides, many users appreciate the flexibility of the interior of the bag. A variety of oil bottles will fit in here, all of them are visible when you open the bag, and there’s a mesh pouch for additional personal items. The Luxja line features other essential oil containers for home use. This case is a great addition to your collection or will work well as your primary oil container. Fans of vintage containers will love this essential oil box. There’s plenty of storage in this case. You have 36 slots for bottles in a 9-inch square. Overall the box is just under 4 inches high. It should be noted that this is a great storage box but not a great container for traveling. Your bottles will be traveling, unprotected, in wooden slots. The risk of things getting banged around or possibly broken is great. Some customers received labels for the top of the bottles and a pad to sandwich between the lid and the bottles; some customers just got the box. Review the description carefully before you make your purchase. This case features a well-constructed lid with hinges that will hold the lid upright when open, so no risk of it flopping back and bending the hinges. The closing clasp is quite hearty. All in all, this is a great storage box for home use. Your oils protect you and increase your well-being, so you need a case that will help you travel with the most essential of your oils. This case needs to protect the bottles, pack well and look great! 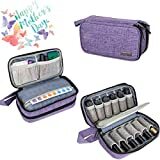 The winner of this line-up is the Luxja Essential Oil Carrier Case. This case doesn’t require you to add labels to the tops of your oil bottles, protects the bottles from outside forces and one another, and has space for other critical travel items. The handle is well-constructed and provides great support for your belongings.